Home > Kits > Panel Kits > Stars All Around Metropolis Kit with Pattern 102" x 102"
Stars All Around Metropolis Kit with Pattern 102" x 102"
Kit includes the pattern plus the fabric to make the top and binding of one King quilt with a finished size of 102" x 102". For intermediate quilters and above. You also need My Favorite Mitering Ruler by Marti Michell. 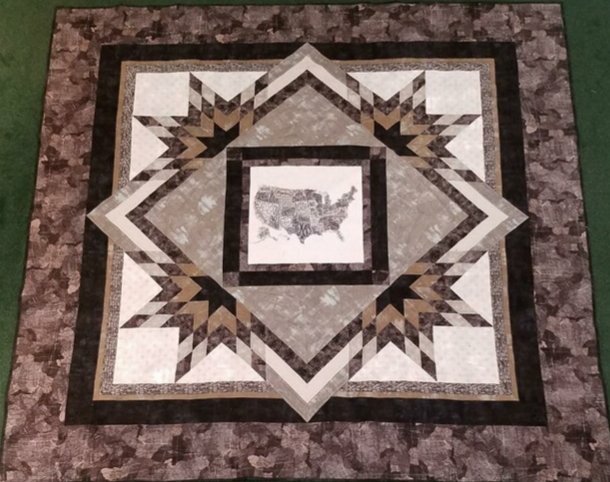 This pattern finishes at 82" x 82" and we include an additional fabric to make the large 10" finished outer border that brings the quilt to the 102" square size. The pattern does not include cutting /piecing instructions for this border. Basic quilting knowledge is assumed.